We happened upon the FreeFlight Tropical Bird Sanctuary a little by accident, but I am so glad we did! 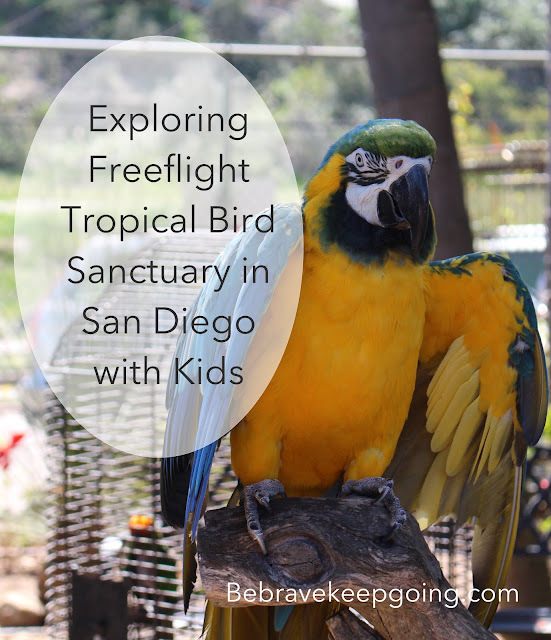 Freeflight Exotic Bird Sanctuary is located in Del Mar and a sanctuary, day boarding facility and shelter for tropical birds in the local San Diego area. It's a great vacation activity if you are looking for something to do while on vacation in Sn Diego or Del Mar. For $5 admission for adults (children under 13 and under are $2), you can observe, feed and interact with a wide variety of tropical birds. 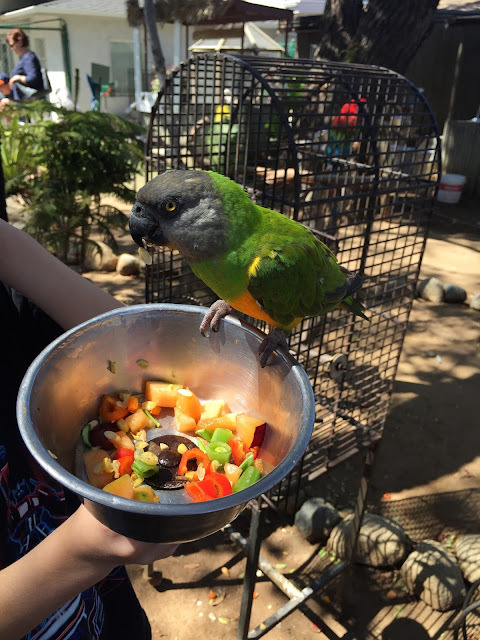 The Tropical Bird Sanctuary in Del Mar/San Diego is open 7 days a week from 10am-4pm. Hot tip! Go at the beginning of the day when the birds have not been around many people. They will be more responsive to being held and touched. For 25 to 50 cents you can get a scoop of diced fruit and veggies to feed the birds. And there were several "docents" and staff on hand to guide, facilitate and share their knowledge of the birds. We learned that tropical birds are intensely social and intuitive amend other things. The Blue and Gold Macaw. Among the many tropical birds: African grey parrot, blue and gold and scarlett macaw, senegal parrot, triton cockatoo and more! 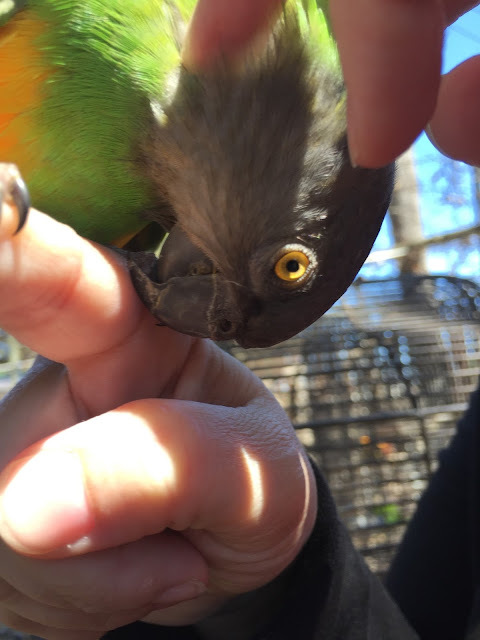 We fed many of the exotic birds at Freeflight. I loved that there was definitely a culture of keeping the birds best interests as the first priority. Some are in cages and some are on perches. On the particular day we went, the Senegal Parrots were the most interactive. Visited the @freeflightbirds Freeflight Exotic Bird Sanctuary in Del Mar today. The kids were able to interact with & feed the birds. The Senegals were our favorite. Can't wait to go back! "Sonny" was a visiting Senegal parrot who loved to be pet like a cat! It was my favorite part of our experience! There is no public restroom, so if you have little ones who need to use the bathroom, you might consider having them use the restroom before you go. Bring tons of change to feed the birds. Save up your quarters to feed these majestic feathered friends. The Freeflight Bird Sanctuary is located on Jimmy Durante Blvd in Del Mar, down the street (south) from the Del Mar Racetrack and Fairgrounds and my suggestion is to not visit during peak race or fair season as it will be quite busy. Your child can become a "junior docent", visit the Freeflight website for more info. It can get very very loud in the yard when the birds get vocal, so if you have sensory sensitive or special needs children, be aware. My son was not wearing his hearing aids, so it didn't bother him. We hope you enjoy Freeflight as much as we do! Thank you for sharing. I had no idea about Freeflight! Your photos are great! I love all of the colors. Thank you for sharing tips and hints! I'll have to take my son on a visit!